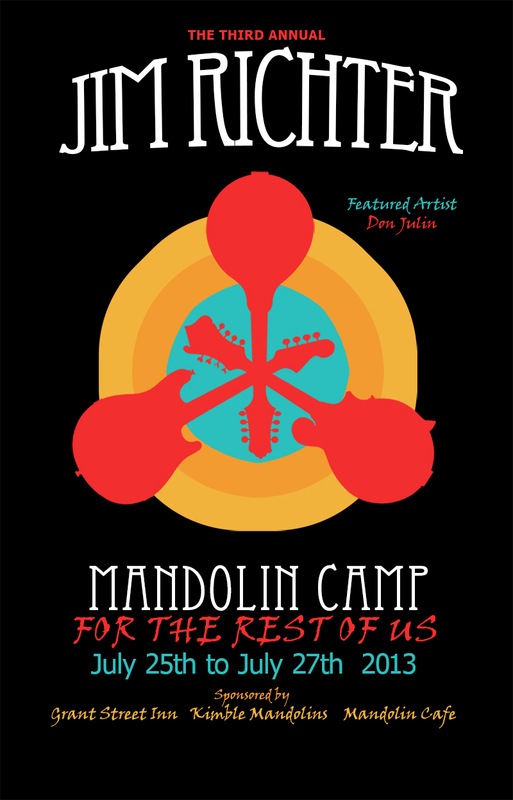 I firmly believe that my mandolin camp is “for the rest of us.” I am striving to create a community of sharing and co-teaching that deconstructs the traditional teacher/student instruction model. Obviously, there will be those who possess more knowledge (that’s why some of you are coming to this camp). However, that knowledge can be imparted in a way that lets the attendees be more than pure consumers of information. The campers should help define the camp. This has been done the last two years in curriculum, as I’ve surveyed campers for workshop focus. This year, our campers have decided our T-Shirt design. 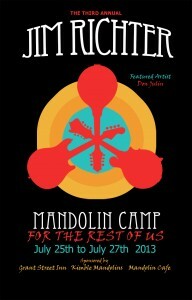 Our T-Shirts, as was last year, have been made possible through the sponsorship of the MandolinCafe and Kimble Mandolins. The T-Shirt design comes from Ron Bird of Designworks, our T-Shirt designer the last 3 years. This year Ron provided several design concepts and polled them.